Each year April 4th is a day to raise awareness of the persistent danger of landmines and the progress made towards complete elimination of their production and use. Even in areas where armed conflicts have been resolved, hundreds of innocent people continue to be killed or maimed for life by landmines. These weapons are indiscriminate, wounding or killing farmers, travelers, children at play, and women and girls collecting water. This day seeks to raise awareness of the problem, locate and mark off areas where landmines persist in order to protect people and livestock, train and deploy teams to locate and remove landmines, and educate people about the dangers in their own areas. It is also a time to press governments to act to extend and implement the banning of landmines. With 15-20,000 adults and children killed or injured by landmines each year, every one of the 84 affected nations need to have organized, government-controlled education and removal efforts to protect their citizens. God of peace, help us to turn away from war and toward unity and respect. 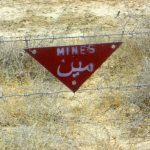 Help us to work courageously for an end to the production and use of landmines that continue to injure and kill long after armed conflicts are over. Help us to protect Earth and to restore right relationship with earth and with each other. 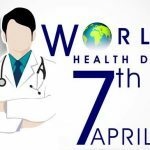 2019 marks the 71st anniversary of the founding of the World Health Organization (WHO). Universal healthcare coverage, in order to secure access to basic healthcare is still a dream in many countries. Even in the United States, one of the richest countries of the world, about 20 million people still have no health coverage. Health security is essential to developing countries if they are to have thriving economies that serve all people. Sharing health information, research and resources equitably is needed in order to meet the Sustainable Development Goals of 2030. We cannot have healthy and sustainable economic development unless people are healthy. Clean water, adequate nutrition and access to basic healthcare are the essential building blocks of any society. Enhancing partnerships that can strenghthen health delivery even to the remotest of areas is a challenge that must be met. This year’s theme, “Universal Health Coverage: Everyone, Everywhere”, is possible to achieve through cooperation, dedication and organization. Holy One, we pray for people throughout the world who do not have access to affordable basic healthcare. Where war and other forms of violence make healthcare delivery impossible, help us to create peace. Where there is inadequate infrastructure, help us to create roads, water source development, sewage treatment and waste disposal options that are safe and sustainable. Where there is hunger and malnutrition, help us to share the fruits of our harvests with those in need. Help each of us to do what we can to make healthy living and access to healthcare possible. In every nation of the world and in every age, children have been found living on the streets, without the protection, support or guidance of a parent or adult guardian. This day is set aside to raise consciousness about the plight of street children and to listen to their voices. All children need love and security in order to fully develop into contributing members of society. Globally, millions of street children live without knowing where their next meal will be found, where they will sleep at night, how they will stay warm in cold weather and who they can trust when they need a friend. Even though children are a society’s most precious resource, street children are often ignored, feared, despised or taken advantage of. Many have lost their parents to war, violence, drug abuse, or abandonment. Domestic violence is often the cause of children running away from home and ending up on the streets. No matter the cause, very few programs exist to try to help street children with food, clothing, health care and education. 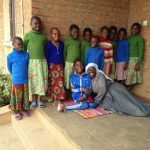 Pictured on the left is S. Afra whose program in Tanzania Africa provides shelter, clothing, food and education to orphaned street children. Most of these children have been orphaned due to the AIDS epidemic. Loving God, protect all street children throughout the world as they struggle to survive. Help us to respond with love and respect whenever we encounter them. Surround them with generous people who will give them food, comfort and shelter. Through our response to them, let these children know that they are loved. Restore their hope for their futures and keep them safe. The 2019 Earth Day theme is: “Protect Our Species.” “Nothing Exists Alone” (Rachel Carson, 1962). All life on our planet is interdependent, and for the first time, the accelerated rate of species extinctions are the result of human activity and its affect on the environment. We must work together to save endangered and threatened species if we are going to successfully preserve the intricate web of life on Earth. Protecting the diversity of environments and species is urgent and requires cooperation, dedication and persistence. These goals align well with the UISG 2-year “Sowing Hope for the Planet” campaign which calls all of us to reflect on the call of Laudato Si to care for Earth and for the poor in a way that protects all of creation. This web of life is sacred. 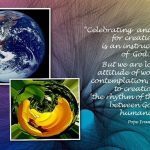 All creation has intrinsic value, revealing to us the wonder and splendor of the Creator. Let us all commit ourselves to protect and honor all creation. Creator God, open our eyes and our hearts to the plight of our Mother Earth. Today we renew our dedication to protect our species by protecting all creation. Help us to honor Earth’s rich diversity. Guide us in our lives as we make the changes necessary to preserve the intricate web of life for generations to come.